I Started a Video Blog! I started a new video blog on Channel 9 at MSDN. I’m going to try to post at least every other week with a video about gaming, IoT, or just some technology I’m working with. Hopefully it will give some people more ideas for fun projects. Check it out here with my first entry, which is a very basic 100-level demystification of Kinect. I link to more advanced Kinect content too. Please check it out! I’m gonna work a bit on the logo and branding but I wanted to get started with videos. We’re having a game jam tonight at Philly Dev Night sponsored by Microsoft! Come out and jam with us at Philly Dev Night! If you haven’t seen my Events Calendar it’s updated with some of the things I’m doing this summer and fall. This upcoming weekend, I’ll be at Drexel for the DragonHacks event! At the end of January, I’m going to be at the MAGfest MAGES event, where I’m participating in multiple game design panels! I’m super-excited! And in March, I’m going to be speaking at the Game Developers Conference, where I’m presenting about good and evil choices in video games! I’m also hoping to attend IndieCade East, and planning on a Grace Hopper Regional event at James Madison University, where I am teaching TouchDevelop. More details soon. I’ve also written up my Games and Trends of the Year 2014 for Tap-Repeatedly.com. Hope 2015 is starting off right for you! On Saturday, I went to BarCamp Philly. At this “Unconference,” I learned that the “Bar” in “BarCamp” comes from the phrase “Foo-Bar” rather than having to do with alcohol. That answered a big burning question of mine, let me tell you! I also delivered a talk about Gamification, wherein I tried out a new crowd game called Cat On Yer Head. Join me below the fold for an explanation of the game, the game book, the talk, and talk acknowledgements! A big common question I get from people is “how do I get started making games?” I’ve spent a lot of my career answering that question for people and trying to de-mystify the process and make game development more accessible to beginners. On November 6, I’m working with Microsoft Game Evangelist Tobiah Marks to answer that question on video for Microsoft Virtual Academy! This is a jump start training for beginners, where we’re looking at some game development and game asset creation tools, and talking about a few of the ins and outs of games as a business in 2014. There’s no real pre-requisite and the training is 100% free! Bring your questions and we’ll see you there! It’s short. 🙂 Hope you enjoy. A new edition of Local Flavor is up at Tap-Repeatedly! This time, I went to New Jersey to visit the islands. No really, check it out! I have some other great content in the works right now, but first I want to take a small moment to talk about journalistic integrity. You see, everyone that I’m interviewing for the Local Flavor series is … someone I know. In some cases, I’ve clicked on their Greenlights, backed their Kickstarters, or watched them develop their games while they were developing those games. For anyone confused about the relationship between game journalists and game developers, rest assured that I am still a journalist developer critic academic who works for a company that manufactures hardware and does game publishing. Hope that clears that up. If you’re interested in being part of the Local Flavor series, even if I haven’t met you yet, let me know! You have to be making cool things (games or game-related) and in reasonable physical proximity to me (though I have one interview from Boston coming up). Hi everyone! I am at Video Gamers United this weekend! Come see me on Saturday at the Women in Games panel. Dave Voyles posted the second part of his prime31 plugins tutorial here. And you might be interested in my interview with Philly game creator Shawn Pierre here at Tap-Repeatedly. Hi, no dev blog update yet, just a quick notice that I am featured on “Five Questions With” this week thanks to TonyV! Thanks Tony! If this sounds different from my usual writing voice, it’s because he asked the questions out loud. I just do my best not to ramble. And sorry Mom, but you totally knew I inelegantly tried to hide all the video games in my college luggage. Long term, I think it was for the best. I’ve been working on a new game project that I want to show a few shots of. I was originally going to do this game for the PDJam, or Public Domain Game Jam, but I completely ran out of time in the weekend. So I tabled it, but I’m hoping to release it anyway sometime this month with better polish and some Windows Phone integrated features. I’m calling this game Sun Run for right now, but that’s just a working title in the Unity project and I’ll probably change it to something a little bit zippier later. 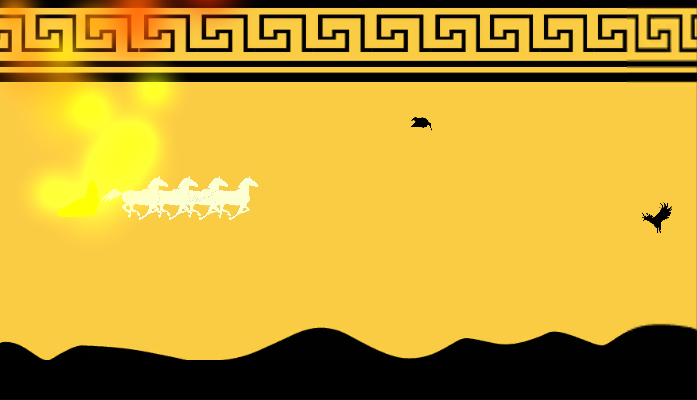 It’s based on the Greek myth of the chariot of the sun. Maybe you know the story: the sun is actually a chariot driven by spirited horses, which carry it across the sky every day. Once the god of the sun, Helios, had a son, named Phaethon, with a mortal woman, and this half-god young man decided he’d like to drive the chariot too. Helios said only a full god would be strong enough, but he finally relented and decided to give the boy a shot. 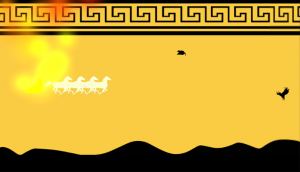 Phaethon failed spectacularly, so now you can experience that spectacular failure, in game form! It’s highbrow, but it’s also wacky. Pretty basic, but I’m going to fill it out over time. I hope the particle effects can stay, but I’m debating how much they harm visibility and performance so it’s a tradeoff. Using the 2D physics in Unity. I’m pretty comfortable with the 3D tools, but the 2D physics stuff is mostly new to me. I’m actually developing the game in 2.5D, partially because 3D makes me happier but also because I’m going to use some 3D tricks, which you can see later. Using some of the Windows plugins from Prime31 to make the game more Metro-friendly. (Maybe) using NGUI as the GUI solution – I’m still working out if the updated GUI features on Unity will be out in time to suit my needs. So this is a learning exercise for me, but the game is simple enough that maybe it’ll be a learning exercise for anyone reading, too. Check back soon and I’ll walk you through the process of how I create my sprites, and some resources that are helping me with this project!